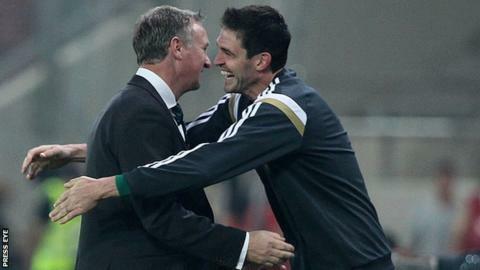 Northern Ireland boss Michael O'Neill praised Kyle Lafferty after the striker scored his third goal in three games in the 2-0 win over Greece. Lafferty sealed victory in his side's third Euro qualifier by scoring the second goal, having also found the net against Hungary and the Faroe Islands. "He has all the attributes you need in a good centre forward," said O'Neill. "Kyle has been fantastic in the three games. He's facing international defenders who just can't handle him." O'Neill, who has taken Northern Ireland to three wins from the first three matches of a qualifying campaign for the first time in their history. added: "He has ability, technique, pace and size." They top Group F by two points from Romania, their next opponents in Bucharest on 14 November. "It's nice to have that record but the main thing is the performance and the three points," said O'Neill. "There wasn't a player we couldn't give plaudits to, every one of them was magnificent. "I'm delighted with how we played - our work-rate, our belief and the fact that we were difficult to break down while being dangerous from set-pieces and on the break." Captain Steven Davis also lauded the impact made by Lafferty in Piraeus, describing him as "the stand-out player in the game". "He made the difference and took our second goal really well," said the Southampton midfielder. "It's been unbelievable - the performances as a whole in the last campaign weren't too bad but we weren't picking up results, just having errors punished. We seem to have nipped that in the bud this campaign." Lafferty himself pinpointed the growing belief in the squad as being the key to the resurgence in Northern Ireland's fortunes. "We believe in ourselves and Michael has put that belief in the team. Every single player believes we can qualify for the Euros and we have sent out a massive statement. "We knew it would be tough against the Greeks but we have great spirit in our team."